The AI-driven NewsPilot system allows broadcasters to automate news production without the need for camera crew or a director. At the 2018 IBC Show, Mobile Viewpoint, a supplier of remote control and IP contribution solutions, will demonstrate its suite of AI-driven live production and delivery solutions. With today’s broadcasters and content owners eager to meet demands for live and online content, Mobile Viewpoint will use its on-stand studio to demonstrate how its solutions enable fast, cost-efficient content contribution—from live capture through to delivery. AI is now proving its value in broadcasting with practical implementations that tackle the challenges facing the industry, including improving the efficiency of production and reducing costs. At NAB 2018, launched three AI-driven products: NewsPilot, IQ Sports Producer and HyperSense. The solutions reduce the cost and complexity of live news and sports content production by removing the need for costly camera crews, production facilities and distribution platforms. IBC 2018 will also see the introduction of Mobile Viewpoint's new 5GLink, a 5G-ready cellular bonding device. Targeted at camera crews and journalists, and designed to be compatible with any smartphone, 5GLink enables the fast transmission of live content. 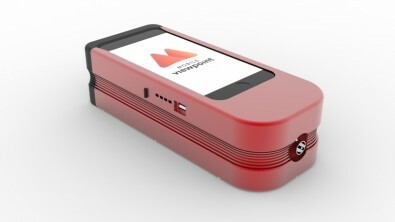 This allows camera crews and journalists to capture emergency or unexpected news with their smartphones. Mobile Viewpoint will demonstrate how 5GLink connects to an SDI camera and enables the transmission of content to live news feeds or the studio. The 5GLink enables the fast transmission of live content over next-generation cellular networks. - NewsPilot: Consists of three PTZ (pan/tilt/zoom) cameras and an automated studio control box, which incorporates its AutoPointer and Virtual Director software. NewsPilot also includes CameraLink, a robotic arm that can move a 3kg PTZ camera much like a traditional dolly arrangement. Together, this allows broadcasters and content owners to automate news production without the need for camera crew or a director. - IQ Sports Producer: An all-in-one production suite that can produce and stream sports events from any location. The production suite includes a fixed-position 24MP 180° camera that can cover an entire field of play, a dedicated appliance with an AI engine and IQ Sport Producer Software, and a connection to the LinkMatrix management dashboard. The AI engine selects which of the camera’s four 6MP lenses to use given the position of play during a match or game. - HyperSense: A fully-supported application box which includes AI Indexer, a tool that analyses and logs metadata based on object, speech and facial recognition algorithms, as well as Smart Storage and Video Search, which stores video and logs metadata in accessible formats, enhancing the value of their video by enabling archives to be searched on more than just text. - TerraLink-4C Multicam: A rack mount bonded transmitter that enables multi-camera shoots without the need of an OB van on site. - LinkMatrix: An online dashboard that allows users to manage their complete live IP workflow. LinkMatrix provides a clear overview of all live feeds from the field, and turns them into real online TV channels by creating playlists, adding logos and graphics, advertising insertion, and pre-roll. Content can be transcoded in the cloud, and published live on any social media platform or CDN instantly.